Slushy Magic Disney Princess and Avengers! 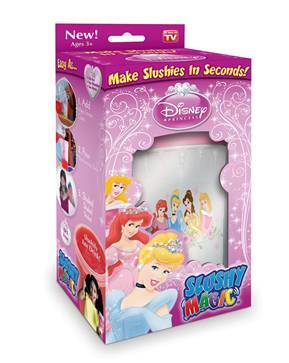 Slushy Magic has been one of the biggest As Seen on TV products ever! 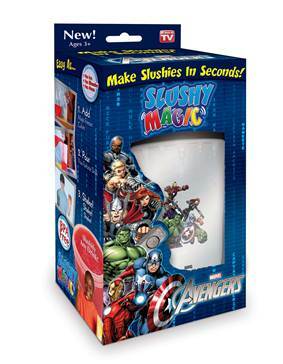 This holiday season we bring you the new licensed Slushy Magics – Disney Princess and Avengers! Your kids are gonna go nuts! In case you’re not familiar with Slushy Magic, Slushy Magic makes delicious slushies out of your favorite drinks in just seconds. The secret is the patented Magic Ice Cubes…simply freeze them in your freezer, pour your favorite beverage into the Slushy Magic Cup, add the frozen Magic Cubes, shake, shake, shake, and now you have a slushy! You can use any drink, too. Licensed Slushy Magics are due mid October. You can pre-order here and make sure you get one!